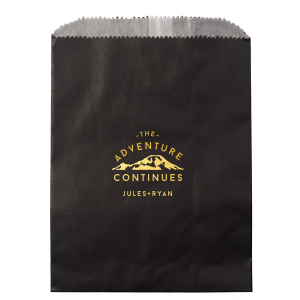 Complete your dessert bar or send home small favors in custom Party Bags. 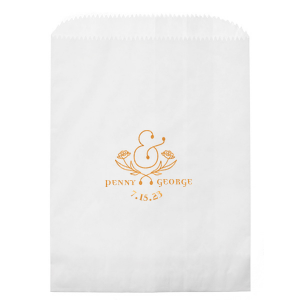 Guests will love this personal detail! 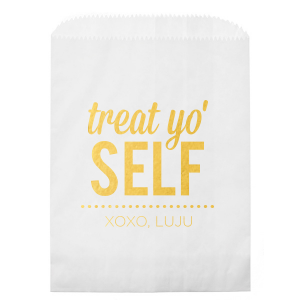 Choose a For Your Party design, create one using our fonts and graphics, or upload your own art. With so many colors and design options, you can create a perfectly themed Party Bag. 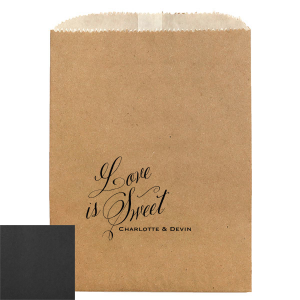 Want to send guests home with an edible wedding favor they'll be sure to love? 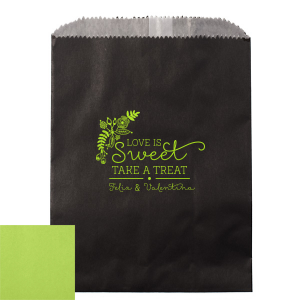 Whatever your confection of choice may be, add to the delight with custom printed party bags from For Your Party! 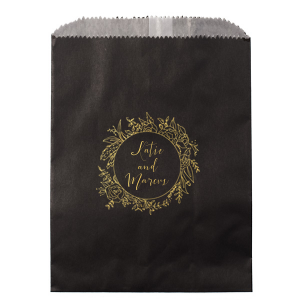 These small gift bags can be foil stamped or custom printed with your design of choice. 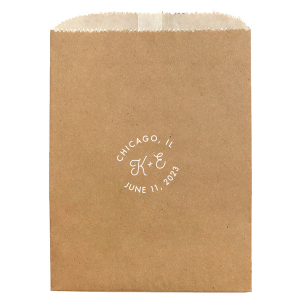 That means, with these treat bags, you can include your wedding logo, personalized monogram or even your wedding hashtag on every single custom wedding favor! 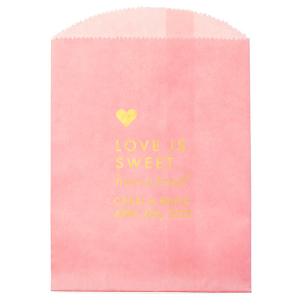 Guests will love the detail of your treat bags and you'll get a thrill seeing your wedding theme carried throughout the decorations on down to the wedding favor table. Custom printed party bags are just the right size to fit a donut or a couple of cookies. 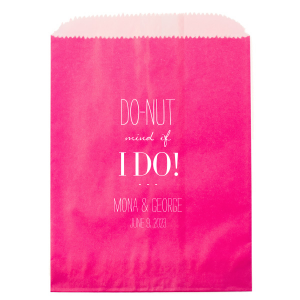 Donuts at your wedding reception are a huge trend right now, so make that trend your own with a personal touch on custom treat bags. 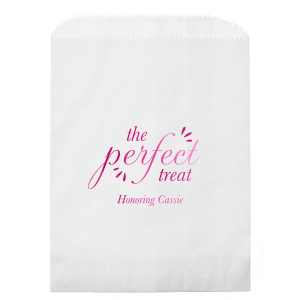 Personalized party bags come in select colors with classic white, black and ivory options, as well as a trendy blush. 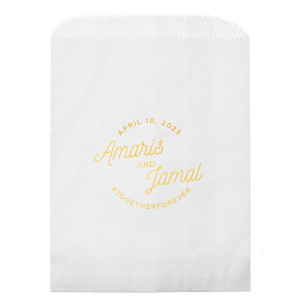 With these party bag colors and a large library of foil colors, you'll be able to create wedding favor bags that coordinate just right with your wedding theme. 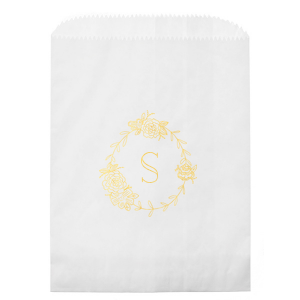 Are you planning a traditional and elegant wedding with lots of flowers and your personalized monogram as a motif? 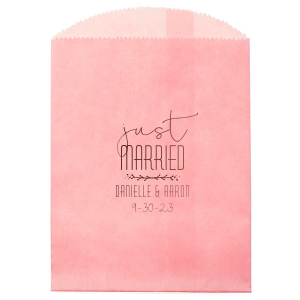 Or maybe you're wedding look and feel will be bold and trendy with a boho vibe. 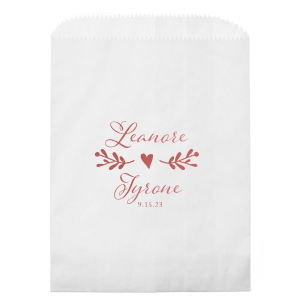 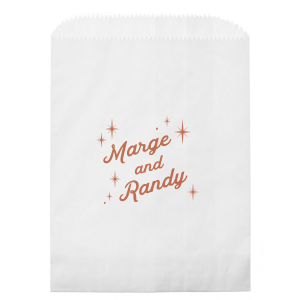 Choose from our collection of fonts and designer created clip art to create the right custom wedding necessities like personalized treat bags. 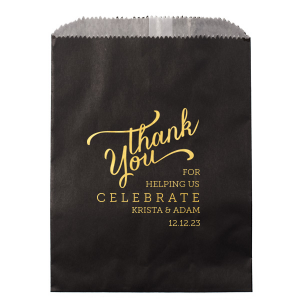 For Your Party custom printed party favor bags don't stop with weddings! 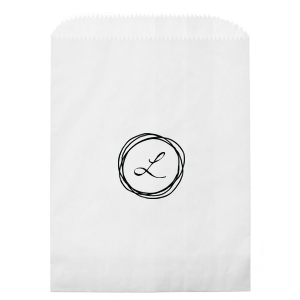 Maybe you're planning your five-year-old's birthday party and need small favor bags. 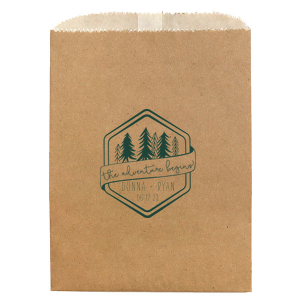 Or you might be looking to gift this year's graduating class with a memento featuring the school's logo on treat bags. Find your birthday favor bags, graduation gift bags, bridal shower favor bags and baby shower favor bags here with For Your Party!